This is a step-by-step guide to connecting your board to the various components of the 3D printer, configuring everything, from the beginning to actual printing. This guide is a community effort, and this page is a Wiki. Please don't hesitate to edit it to fix mistakes and add information, any help is very welcome. This guide will walk through everything you need to accomplish to successfully perform these steps. At the end of this guide, you should have a fully working machine. Some users have hand-translated this page. Note that this translated version is by definition never going to be up-to-date. Use it to help you understand in general, but any specific information should be taken from the original version, especially before asking the community for help. Your Smoothieboard comes with a micro sd-card in the microSD slot. The boards come pre-flashed. With a basic configuration file installed on the SD card, no preparation is needed before you can connect Smoothieboard to your computer and start interacting with it. The first thing you might want to do before you start connecting your board, is to look at our list of Software, and install a “host” program to talk to the board. Don't have a Smoothieboard ? A good first step is to connect your board to your computer to familiarize yourself with it. Connect a USB-B cable to the USB connector on the board, and to your computer. A moment after connection, your computer will recognize the Smoothieboard as a USB Mass Storage Device (like a USB disk-drive or a SD card reader), showing you the files present on the SD card. Drivers are needed for Windows 7/8, while Linux and Mac OS X directly support the device, you can find those drivers here. This allows you to add, copy, edit or delete any file you'd like. Already present on the SD card is a file named “config”. This file contains all of the configuration options for your board and is read when you start or reset your board. You edit the configuration simply by editing this file in a Text Editor, saving it and resetting the board. No need to recompile or flash the board. 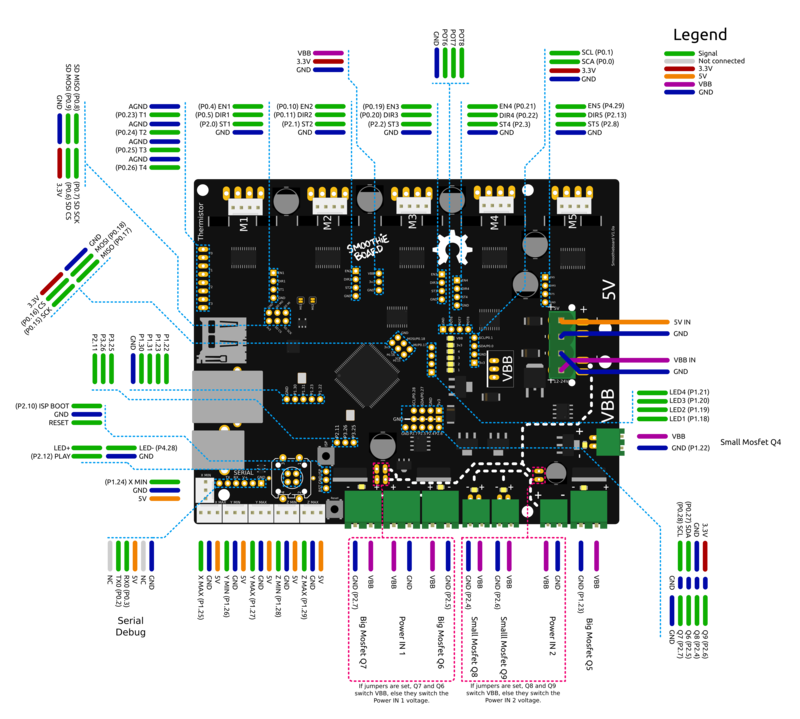 The SD card can also be used to flash a more recent version of the firmware to your board, while the pre-flashed firmware should work this is not always the case, see where to get the binary file and how to flash it via the SD card. It can also be used to store and play G-Code files, see Player. USB Mass Storage is not the only thing you get when you connect the board. The board also exposes a USB CDC Serial interface, allowing you to send G-Code and receive answers. (There is also a DFU interface for flashing firmwares but that's mostly for developers). The CDC (Serial) interface is the interface host programs like Pronterface use to allow you to interact with your machine. If you are already familiar with it, you can try connecting right now and get an answer from the board. If not, we explain it all later in this guide. 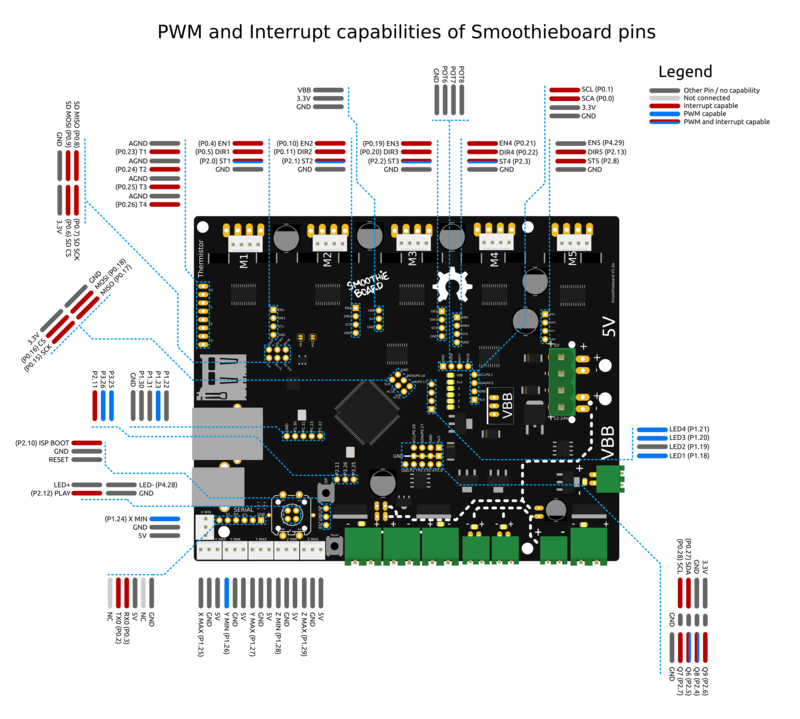 The other main communication interface present on the Smoothieboard, apart from the USB port, is the Ethernet port, which allows you to connect your board to your local Ethernet network, and talk to the board via TCP/IP. This is the same kind of technology you would find on a network-connected 2D printer for example. It allows you to access a web interface the board serves, and control the machine via your browser. It also allows you to connect some software that supports it ( like Pronterface and Visicut ) to your Smoothieboard via the network. Network is disabled by default, but is very easy to enable and configure. It is also the recommended main method of communicating with your Smoothieboard. Now that you have your board, a very good idea before starting is to update your firmware to the latest version. You do this by downloading the latest Firmware.bin file, copying it onto the SD card, and resetting the SmoothieBoard. Then, the new firmware will “flash” ( you will see the LEDs on the board do a little “dance” ), and you will then have the latest version. This is particularly useful if you ever need to ask for help, as people helping you will be assuming you have the latest version. You can find the file, and information on how to flash it, at Flashing Smoothie Firmware. Before you start wiring your machine's elements to the board, there are several things you need to keep in mind and be careful about during all of the assembly. Make sure you read this. Seriously. Not kidding. Do it. It's important. Always make sure the polarity is correct when wiring in power inputs (coming from the Power Supply). Reversed polarity can damage or destroy all or part of your board. Polarity is indicated on the board itself by the + and - signs. Double check. On older versions of the board, markings are partially hidden by the connector, making it confusing. Rely on only the diagrams. To check the polarity of your power source, attach your multimeter probes to the two wires of your power source respectively. If the voltmeter reading is positive it implies that the red probe is connected to the positive wire (+) and the black probe to the negative wire (-). The main (labeled VBB) power input has a reverse polarity protection, however, it will not hold forever. As soon as you notice something is wrong, turn the power supply off and check again. Never disconnect or connect stepper motors from the stepper motor drivers while the board is powered (i.e., when the Power Supply is turned on). The drivers have very good protection against most possible problems and are very hard to destroy accidentally. But it is possible. Be careful that nothing metallic ever touches the board while it is powered on. Falling screwdrivers, nuts and bolts can cause shorts and destroy the board. Check the board before powering it on. Do not press the reset button with anything metallic, as you could slip and cause a short, use a plastic screwdriver or the like. Always check the schematic before connecting power sources (coming from the Power Supply) to the board. Connected to the wrong connector can destroy components. A common example of this problem is plugging a power input cable, into the connector for an output, or plugging the limit switches in backwards. Make absolutely sure of your connections using crimps or screw terminals, from wires to any type of connector, are very careful and well done. Connections (to the stepper motors for example) lost while the machine is running can destroy your board. In the case of the VBB power input, be careful. If your board came with connectors pre-soldered, the 5mm connector is present, and the polarity of that connector is that of the large traces in the wiring diagram to the right (red is +, blue is -). On some boards, the marking on the boards may be hidden by the connector itself, so for VBB, do not rely on the markings on the board, but on the diagrams on this page. However, if you did not get your connectors soldered, and want to solder a 3.5mm connector instead of a 5mm connector, also note that the polarity is the opposite. USB can, in some setups, be subject to interference, which causes disconnections, and can ruin your work. This is very hard to prevent if it happens even in normal conditions. Ethernet, on the other hand, does not have this problem: save yourself the trouble, and use Ethernet right away. It's very nice. See Network for information on how to set it up. If you receive a bad board, you will get a replacement. But if you destroy your own board, your only options will be to fix it yourself (which can be quite difficult), or get a new one. Plugging 12-24v (motor power) into anything you are not supposed to. Like the 5V line, or an end-stop or thermistor input for example. Problems with the 5V or 3.3V power are not as much of a problem as the board is 5V-tolerant, so wrong connections and shorts should be okay as long as they do not last too long. Using an inductive load (like a motor, fan or solenoid) on a MOSFET, without a diode across (see Fan documentation). The general idea here is: always make sure everything is clean, and double-check everything before turning the power on. You can not learn by making mistakes here, as mistakes will likely cost you your board. Electrostatic discharge can also destroy your board : make sure you properly ground everything. If your machine contains any heating element and uses the temperature control module to control it, please make sure you read the section about implementing all safety measures here, and implement as many as you can. Fires will kill you if you don't. Be aware of your environment : it's not just the machine itself. In particular, you are even more in danger if you are using your machine in a confined space, always be on the watch for safety issues. To properly understand some of the safety instructions in this documentation, basic knowledge about electricity is required. See this page for a refresher on the basics. Your board needs two sorts of power to work : 12-24V power to turn motors, heat hotends, etc, and 5V ( or “logic” ) power to power the microcontroller ( the brain ). If voltage and current are strange concepts to you, it's probably a good idea before you continue setting up your board, that you read this introduction. The board's logic circuits ( 5V line ) typically consumes up to 500mA current ( what is standard for a USB port ). Without power, your board can not do much. The board uses power to move stepper motors, and power heating elements, fans, and others. Voltage (V) : Can be from 12 to 24V. While most of the components on the Smoothieboard are rated up to 32V, it is not recommended or supported to use that voltage. 12V PSUs are more common, and generally cheaper. However, the higher the voltage, the more you will get out of your stepper motors. This is the reason some designers use 24V PSUs. However, be careful that with a 24V PSU, you will need 24V fans, and will need to reduce the PWM setting for your heating elements. Current (A): The total current required is the current for each stepper motor, plus the current for every peripheral on your machine Smoothieboard will control. This depends on your machine type. On a typical 3D printer, you can safely consider that 10A for the heated bed, and 10A or a bit less for the rest of the elements, is enough current. Go for a 17 to 20A PSU if you have a heated bed. 7A to 10 is probably enough if you do not have a heated bed (or if you are setting up a CNC mill or a laser cutter). If you bought your machine as a kit, a PSU with appropriate current is most probably provided (or one is recommended). If building your machine yourself by self-sourcing, the documentation for the machine model will also most probably recommend a current rating. A power supply that is able to supply more current than is needed is not a problem. Having not enough current to drive your hot-end, heater bed, or motors is a problem. Make sure you use a Regulated Power Supply, make sure you connect the ground wire for the mains to the power supply, and if it has a fan, make sure it has sufficient space around it to let air flow and cool it appropriately. To wire the power supply unit to mains (wall AC power), make sure you connect the right colored wires to the right connectors on the PSU. The 3 connectors are “live”, “neutral” and “ground”. Color changes from cable to cable. Once the wires connected to the PSU, make sure none of your computers is doing something important (like a system upgrade). In case something goes wrong, plug the PSU into a power strip with an on/off button. Then turn that button ON. If your house loses power, you did something wrong. If an LED illuminates on the PSU, everything is fine: unplug the PSU and continue. If you are new to wiring, please check our how to wire guide. NEVER manipulate mains (220/110V) power wires while they are plugged into the wall plug. Unpleasantness and/or death are common consequences of not respecting this rule. Ground your printer's frame by connecting it to the Earth terminal on your power supply. In the (unlikely) event that a power supply wire comes undone and touches the printer's frame, this will prevent you from getting an unpleasant and/or deadly shock. Now that the PSU is getting mains power, your PSU is converting it into 12 or 24V power. You need to connect wires from it to the Smoothieboard to provide power. The most important thing is to respect polarity : + goes to +, - goes to -. On the PSU, + terminals are indicated as +, V+, 12V+ or 24V+. Ground (-) terminals are indicated as -, V-, COM or GND. On the Smoothieboard they are indicated simply as + and -. By convention, black (sometimes brown) wires are used for ground, and red (sometimes orange, white or yellow) wires are used for power connections. Once the wires are correctly connected, you can turn the PSU ON. If everything was done correctly, the red LED (marked VBB) on the Smoothieboard will light up brightly. If it does not, immediately turn the PSU off. Check polarity, and check all the connections are strong and properly done. When you turn the PSU on, make sure you are ready to immediately turn it back off. Now that the board has power, you can use that power to move things! It is recommended you setup an emergency stop button on your machine, so that in case of a problem, you can easily and quickly turn the machine off. For information on how to do this, please read EmergencyStop. It is important you choose the right motor for your application. The most common mistake is to choose a high inductance motor. There are two main “families” of motors out there : high inductance motors are mostly designed for maintaining position and moving rarely ( like on a telescope mount ), and low inductance motors are designed for moving often, and at high speeds ( like on a CNC mill or 3D printer ). If you use a high inductance stepper motor with a Smoothieboard ( or any “CNC” stepper motor driver ), not only will you get bad speed/torque performance, but when moving the stepper motor ( or axis ) by hand, very high voltage will be generated, which can destroy your stepper motor driver. You can recognize a “high inductance” stepper motor by the fact that it's rated inductance is high, in general higher than 10mH is bad. If your motor doesn't tell you it's inductance, rated voltage is also an indication : high inductance stepper motors usually have high rated voltages, a typical value being 12V, where “CNC” steppers have voltage bellow 5V. Documentation: Look at your motor, find its part number. Then google it. If you are lucky, you will find a schematic or a data-sheet that will indicate which wire goes to which pole. Note the colours that correspond to each coil. Fingers: When the two wires for a given pole touch together, a closed circuit for that pole is created. This makes the stepper motor more difficult to turn. You can use that effect to discover the poles. Turn the stepper motor shaft, it should turn freely. Now take two wires, and make them touch. Turn the shaft again. If it shows resistance, is harder to turn, you found a pole. If it doesn't, keep one wire, and try another one for the second one. Do this until you find a combination that shows resistance. Once you find the two wires for a given coil, the other two wires are simply the other coil. Note the colours that correspond to each coil. Multimeter: Configure your multimeter to read resistance. Then the method is the same as the previous one, take two wires at random, test them, except you know you find a coil when you measure electrical resistance between two wires. If you measure no contact, try another wire combination. Note the colours that correspond to each coil. Now, as described in the “Unboxing” paragraph, connect the board to your computer, open the “config” file with a text editor, and change the configuration value for each stepper motor driver to the correct value. Each step is divided by the stepper motor driver in a certain number of microsteps. It is that number, and not the number of full steps, that we want. Smoothieboard V1.1 always divides steps into 32 microsteps. (16 for older smoothieboards). Now you need to move an axis to make sure the stepper motor is turning in the right direction. In Pronterface, click near the yellow arrow marked “+X”. In a 3D printer, you heat thermoplastics. There are two different parts in which you want to do that. First the hot-end heats the plastic to the point where it is liquid enough to go through the nozzle. Second, the heated bed (in only some printers), on which the first layer is deposited, is heated to allow for better sticking of the plastic to the bed, and more uniform temperature in the part while printing. A thermistor's resistance changes with temperature. By reading that resistance, we can determine the temperature of a hot-end or a heated bed. This allows Smoothie to turn the heater on or off depending on the temperature it reads, to achieve the desired temperature. To wire the thermistor, take the two wires from the thermistor on your hot-end or heated bed, and connect them to one of the pairs of thermistor inputs on the Smoothieboard. Each input is two pins, one for each thermistor wire. There is no polarity to respect. Smoothieboard has 4 thermistor inputs total, meaning a line of 8 pins on the edge of the board. Polarity is not important for thermistors. The Smoothieboard has two grounds : a normal Ground, shared with the motors and everything else, and a special Analog Ground, which is isolated from the rest, to protect the very sensitive ADCs ( analog to digital converters ) used to read temperatures. When reading temperature, never use the normal ground to read temperatures, always use the AGND connections provided on the thermistor inputs. This also means you can not “share the ground” on wires going to your hotend, as some users sometimes do to “save wires”. This is a very bad idea and will cause a lot of problems. You can, however, use any thermistor pin you want for any temperaturecontrol module you want. There are different models of thermistors. Each hotend or heated bed has one, and it's a specific given type. Different thermistor models translate a given temperature into different resistances. This means you must tell Smoothie which exact thermistor model you have, to be sure Smoothie can read it correctly. This is done using the thermistor option in the configuration file. You pass it the name of your thermistor, and it will configure the math correctly accordingly. In case you have a thermistor that is not known to Smoothie you can simply define the parameters in config. There are two methods, using the beta value ( good but not perfect ), and using the Steinhart Hart algorythm ( perfect ). The betas published by most manufacturers, are for the 0-80°C range. For the 185-230°C this results in readings being about 7-10°C too high. This means beta values are usually good for a heated bed, but not for a hotend. If the thermistor is 100K ohms at 25°C then this is usually enough. You can also set r0,t0,r1,r2 but this is not usually needed as the defaults are sufficient. If you do not know what thermistor model you have, contact the designer or seller of your 3D printer, hotend or heated bed and get the spec which will tell you what the beta value is for the thermistor. To find what the Steinhart Hart coefficients for a given thermistor are, please read the SteinhartHart page. Now that Smoothie can read the temperature, it needs a way to heat things and maintain a desired temperature. This is the heating element. On a hot-end, that is usually a resistor or a cartridge heater, on a heated bed, that is usually a PCB plate designed to have the right resistance, or a kapton heated bed. Because of its resistance, when power is applied to a heater, the heater consumes energy to generate heat. These heating elements need to be connected to Smoothieboard on a port that allows Smoothie to turn them ON or OFF as needed. This is done by the use of MOSFET that takes a digital input signal, and, depending on its value, lets current pass or not. Mixed MOSFETS pair : Their outputs are labelled P1_22 and P1_23 on the schematic. The pair is called “mixed” because it consists of one big MOSFET and one small MOSFET. They do not have a specific input, they take power directly from VBB ( the Stepper motors power input described in the Stepper Motors chapter ). To power those mosfets, you need to provide them with power by wiring their power input ( which is the same as the one for the stepper motors ) to the power supply. Trying to power a 40W ( or more ) hotend cartridge heater at 12V with the small FETs will destroy them, locking them to the “ON” state. There is an alternative however. For each pair, you can use jumpers ( one jumper for the small MOSFETS pair ( JP28 ), two parallel jumpers for the two big MOSFETS pair ( JP11 and JP27 ) ). If you solder the pins for those OR connect a jumper to those pins, closing the circuit to VBB ( the stepper motors power input ), allowing you to take the power from those MOSFETS from the same place as the stepper motors do. Let's say you want to connect a heated bed to your Smoothieboard. First, wire the thermistor to the thermistor input. Then, find out (from the Internet, or your seller/manufacturer) the current rating for that heated bed. In this example it will be the classical RepRap PCB plate Heatbed. Ours has a 11A current rating, this means we can not use it with a small MOSFET, and we need to wire it to a big MOSFET. We connect our PSU to the power input for the big MOSFETS pair (don't forget to check the labels on the board for polarity). Then we connect the two wires from the PCB bed to one of the big MOSFETS out. Polarity is not important here. Because this is the heated bed, we connect it to the P2_7 (pin 2.7 in the configuration file). This is a convention: it is configured that way in the default configuration file, meaning that if you connect it there, you do not need to change the configuration file to specify where you are connecting it: the configuration file is already correct. For the hot-end, the default output is P2_4 (pin 2.4 in the configuration file). Once your thermistor is connected, and both the power input and the heater elements are plugged in, you are ready to test your temperature controller. To do this, reset your Smoothieboard, then connect to it using host software like Pronterface, or using the web interface. If anything burns or smells funny, turn everything off immediately and investigate. The heaters are off by default when Smoothie starts. Check that they are not heating ( one indication of the heater being ON is if the LED near the MOSFET is lit up, the other being checking the heater itself ), if they are heating, something is wrong, turn everything off immediately and investigate. Now, in Pronterface, set the temperature for either your bed or your hot-end, depending on what you are testing ( wire and test only one at a time for easier problem investigation ) at a low temperature (20°C above room temperature is a good idea), and monitor temperature to see if the temperature rises. If it does rise, everything is fine. If not, turn everything off immediately and investigate. Once you know the heater works correctly, there is still some tuning to do:Â tuning your PID settings. But there is a big problem with that method. Due to temperature not travelling instantly in what you heat from the heater to the thermistor, when the thermistor reads a given temperature, the heater is already hotter than what the thermistor reads. And that overshooting is something we do not want. It means reaching temperatures that could be undesirable, and it means you will not be able to correctly stabilize the temperature. The solution to this is PID. It uses some math, allowing us to correct those problems by turning the heater on and off in a smarter sequence. Do not try to use PID settings from Marlin as they are not compatible. Using a process described here http://brettbeauregard.com/blog/2012/01/arduino-pid-autotune-library/, Smoothie can automatically tune ( find ) your P, I and D factors. E0 is the number of the heater or bed temperature control module, determined by the order that they appear in the config file. Here it would be 0 for the hotend, and 1 for the bed. PID Autotune Complete! The settings above have been loaded into memory, but not written to your config file. Which will save the configuration values automatically in a configuration override file. Do not send M303 over the web interface, use Telnet, Pronterface or any other serial terminal. If sent over the web, the answers will accumulate in Smoothie's RAM and may crash it. There are features you can configure to make sure that your temperaturecontrol module will detect when something is wrong, and stop the machine when that happens. It is a good thing to read about these, and configure them as best as you can, because your house burning down is a very bad thing. It is also a good thing to configure it well, because if you do not, it is possible Smoothie will think there is a problem when there is none, which can be annoying. You can read more about temperature control safety here. This information is all very abstract. We are going to use the first big mosfet to control the bed, it has a current limit of 12.5A so we are within limits. We also need to provide power to the first big mosfet via the big mosfet power input. We can not however use the second big mosfet for anything, because if we did, we would go over the 12.5A limit of the big mosfet power input's connector. This is because the input must provide power to both outputs, so if we were for example to connect a 12.5A load to the first big mosfet, and a 2.5A load to the second big mosfet, the total passing through the big mosfet input would be 15A, which is over the 12.5A limit. Therefore, we will use the first small mosfet to control the hotend. 3A is well within it's limit. Here again, we need to provide power to the small mosfet, via the small mosfet power input. End-stops are small interrupters that you put at the end of each of your axes. When you boot your machine up, Smoothie has no way of knowing the position of each axis. When it starts a print, Smoothie moves the axis until it touches that interrupter, and when it is hit, it declares that that is position 0 for that axis. And does so for all axes. This allows Smoothie to then precisely know where everything is relative to that initial position. It is quite convenient as it saves you the hassle of actually moving the machine into that position when you want to start a print. Automation is great. However, end-stops are not necessary, you could do without them. They are just so convenient that most machines use them. End-stops can also be used as limit switches which prevent the machine from attempting to move beyond the physical limits of the axis (by pausing/stopping movement when triggered), see the Endstops page for details about configuring Smoothie to use End Stops as limit switches. Smoothie does not allow you to use a zprobe as an endstop. An endstop must be dedicated to being an endstop and cannot be used as a zprobe and vice versa. This will concentrate on the most common type of end-stops : the mechanical ones. Other types exist like optical or hall-o sensors. However, please note that the general feedback from the community, is that most of those are either less precise, less repeatable, or much more difficult to get to “work right”, compared to the classical “mechanical” endstop. The mechanical endstop is actually likely the most precise, repeatable and easy to get to work option you have at your disposal. Just because these other options exist and have been explored by the community, does not mean they are better. You might happen have a good reason to use a fancy endstop, but if you don't, it's likely a good idea to stick with a mechanical one. Mechanical end-stops are simple interrupters : when not pressed, they do not let the current pass, when pressed, they let the current pass. By connecting a digital input pin on the Smoothieboard to the interrupter, and connecting the other side of the interrupter to Ground, the Smoothieboard can read whether or not it is connected to Ground, and therefore whether or not the end-stop is pressed. NO : Normally Open, meaning it is not connected to C when the interrupter is not pressed, and connected to C when the interrupter is pressed. NC : Normally Closed, meaning it is connected to C when the interrupter is not pressed, and connected not to C when the interrupter is pressed. You want to connect the **Signal** ( green in the schematic ) and **Ground** ( blue in the schematic ) pins for the end-stop on the Smoothieboard, to the **C** and **NC** connection points on the end-stop. For each endstop, we connect C to Signal and NC to Ground because this means the digital input pin ( endstop connector ) will be connected to Ground in it's normal state and cut from Ground when the button is pressed. This approach is less prone to noise than the reverse. See here for more information. Another positive effect of this approach is, that if a wire breaks for some reason you get the same signal as if the endstop is pressed. That makes sure that even with a damaged wire you are not able to overrun the endstop. Order is not important as polarity is not important here. Make absolutely sure that you do not connect VCC ( red ) and GND ( blue ) to a mechanical (microswitch) endstop! Depending on your wiring this may fry your smoothieboard instantly or when the switch gets pressed. 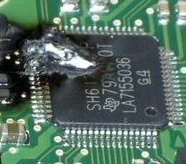 There is certain wiring where this won't happen when you switch the signal between VCC and GND, but if you're not careful enough you will damage your board. You want to connect your X end-stop to the X min pins, Y end-stop to the Y min pins, and Z end-stop to the Z min pins. Mechanical endstops are simple switches, they simply let a signal pass through, or not, allowing us to detect their status with an endstop input. It has no intelligence of it's own. There are more sophisticated endstops. Those are “powered endstops”, for example : Hall-O ( magnetic ) or optical endstops. The only difference between a mechanical endstop and those powered endstops is that they require being provided with 5V power. This means that where for a mechanical endstop you connect the Signal and GND pins, for a powered endstop, you connect the Signal, GND and 5V pins. Other than this, it works exactly the same as a mechanical endstop : The Signal pin receives something different depending on whether the endstop is triggered or not. Some connect Signal to Ground when triggered, and Signal to 5V when not triggered. Others connect Signal to 5V when triggered, and Signal to Ground when not triggered. To know exactly what your endstop does, see it's documentation. If once wired, your endstop reports the opposite of what it should via the M119 command ( 1 when not triggered, and 0 when triggered ), see the “Testing” section. In some very rare cases, the endstop reading circuit on the Smoothieboard will not be adequate for your endstop type. In this case, you should use a “free” GPIO pin on the Smoothieboard that nothing else uses to connect your endstop to. See Pinout to find adequate pins. The default configuration most probably already has everything you need : the pins are already correct and the default speeds are reasonable. Once they are wired, you can test your end-stops. To do this, reset your Smoothieboard, then connect to it using host software like Pronterface or the web interface. Now in Pronterface, home one axis by clicking the small “home” icon for that axis. Begin with X, then Y, then Z. If your axis moves until it hits the end-stop, then stops when it hits it, moves a small distance back, then goes a bit slower back to the end-stop and stops, that end-stop is working fine. On the other hand, if the axis moves a small distance in the wrong direction, then stops, you have a problem : your Smoothieboard always reads the end-stop as being pressed. So when you ask it to move until the end-stop is hit, it reads it immediately as pressed and stops there. Another problem can be that the axis moves and never stops, even after the end-stop is physically hit. This means your Smoothieboard actually never reads the end-stop as being pressed. There is a command that allows you to debug this kind of situation : in Pronterface, enter the “M119” G-code. This means : X endstop is pressed, Y and Z endstops are not pressed. Use a combination of this command, and manually pressing end-stop, to determine what is going on. If an end-stop is read as always pressed, or never pressed, even when you press or release it, then you probably have a wiring problem, check everything. If an endstop is read as pressed when it is not, and not pressed when it is, then your end-stop is inverted. First most often your hot-end's “cool” part (the top of it) needs to be cooled so heat does not accumulate there and transfer to the rest of the machine and damage it. Secondly, you often (in the case of printing PLA) need to cool down the top layer currently being printed by your machine so that heat does not accumulate in the printed part and cause mayhem. While the first one is usually safest being always powered on, the second one you want digital control via MOSFETs, as most modern slicing software allows for smart control of that fan. For the fan that is always ON, all you need is to find power somewhere to power it. You can wire it directly to your PSU ( + goes to +, - goes to - ), but there is also a little trick if you want to wire it to your Smoothieboard. If you add the jumper to JP28 like described in the MOSFETs section of the Temperature Control section of this tutorial, then the connector usually used for providing power to the small MOSFETs, will actually output whatever power is provided to the VBB (stepper motors) connector. This means you can simply add this jumper, then connect your fan to the small MOSFETs power input (X6). You do not need a big MOSFET to control a fan. One of the small MOSFETs is more than enough. See the Temperature Control section to identify which you want to use and which GPIO pin corresponds to that MOSFET. Now wire the fan to the output for that MOSFET (here it is the first small MOSFET, using pin 2.4), make sure you respect polarity. You can now control your fan digitally: issue the M106 G-code to turn it on, and M107 to turn it off. Those are also the commands slicing software generates to control fans. Fans ( and other active loads like solenoids, mechanical relays, motors, anything with a coil ) can feed power back into the MOSFET and destroy it. Note starting with Smoothieboard version 1.1, **you do not need to do this anymore** on the first two small mosfets, as the diodes are there by default. If you are using a 24V PSU, do not use 12V fans. You definitely need 24V fans with a 24V PSU. Lowering the PWM is not going to work, and will destroy your fan. A panel is the combination of a screen, and some kind of input method, attached to the machine, that allows you to easily do things like move the carriage, start a file, monitor it's status, etc. In order to use a panel with a Smoothieboard, you need to wire it to the board, and to modify the configuration file so the board knows it's talking to a panel. There are different types of panels supported by Smoothieboard, to learn how to wire and configure for your specific panel, please read the Panel page. If you use Pronterface with your 3D printer, you can use its built-in serial terminal feature - just prefix serial commands with an “@”. So, once connected to smoothie send “@help” and it will list all of the available commands. How well your machine is wired is going to determine how long it lives and how resistant it is to breakage. We have a great guide on different techniques and recommendations, please read the how to wire page. If your Smoothieboard came with connectors, you got connector casings, and crimps. You will need to attach your crimps to your cables, and then insert the crimps into the connector casings. This tutorial is a good read about crimping properly. Please be careful and patient, if you have never done it before you will probably fail a few times before getting the hang of it. Also be careful to insert the crimp into your connector the right way around. Please read this comic before soldering anything. Stepper motor drivers on Smoothieboard can handle up to 2Amps per driver. If you want to control two separate motors with a single driver ( for example you have two stepper motors for your Y axis like on a Shapeoko, or two stepper motors for your Z axis like on a Reprap Prusa i3 ) and have both motors move simultaneously, you have two options. If the total of the current used by your motors is more than 2Amps ( for example two 1.5Amps motors are 3Amps ), you can not wire them together on a single driver, and you need to look at doubling drivers just bellow. However, if your total current is less than 2Amps, you can wire both motors in parallel to a single driver. To do so, find for each stepper motor, which wires match which coils, and wire the same coils into the stepper motor connections on the Smoothieboard ( two wires per connection, one from each motor, for each pin ). If when you test it, the two motors turn in reverse, you need to reverse one of the coils of one of the stepper motors, and they will start turning in the same direction. If you need to drive two motors with a single axis, but the total current used for the motors is more than 2Amps ( for example two 1.5Amps motors add up to 3Amps ), you can not wire the steppers in parallel to a single driver and have it control both motors at the same time like described above. This is the case for example for the Y axis of Shapeoko machines. In this case, you will need to use one driver for each of your motors. This means you need a Smoothieboard with one more stepper motor driver than you have axes. If you have 3 axes and need to double one, you will need a 4X or a 5X Smoothieboard. To enslave a driver to another, you will need to connect the control pins for both drivers together. The connectors for this can be found close to the stepper motor drivers, and are labelled. Then, you need to make sure that none of the step, dir and enable configuration values for your slave stepper motor driver, are present in the configuration file. If they are, remove them. And be careful, for the delta driver, if you started from the 3D printer configuration file, they are not refered to as delta_xxx_pin but as extruder_xxx_pin, if they are present you must remove them all. Only remove the lines for the slave driver. The logic pins that control the stepper drivers are broken out on all 5 axes to 1×4 pin headers found near each driver on the board. The 4 pins are EN, DIR, STP, and ground. These pins or their equivalents are found on most external stepper drivers. Many drivers call the STP (step) pin PUL (pulse). Some will call the DIR (direction) pin PHA (phase). Most external drivers have both a + and - pin for each of EN, DIR, and STP. The simplest way to connect the external driver is to wire Smoothieboard GND to all 3 - pins, and the logic pins of Smoothieboard to the corresponding + pins. Note that Smoothie is 3.3V logic and each pin can only supply a maximum current of 4 mA, which is not usually a problem unless interfacing to very large, or very old external drivers which may need a little more. While this example will show using the pins of one of the on-board drivers to control the external driver, you can use pretty much any free GPIO pin to control the step/direction/enable pins on your external driver. See pinout and pin usage to find free pins. All loadouts of Smoothieboard (3x, 4x, 5x) can control 5 external stepper drivers using these ports. The presence or absence of a built in driver will not affect the external driver. This shows control of an external driver using the pins on the positive side of the external driver's input. Please note, if your external driver requires 5V, that Smoothieboard only provides 3.3v on it's output pins. Two solutions to this : either use a level shifter or use the Smoothieboard's pins as Open-Drain ( ie linking to ground instead of linking to 3.3v, when closed ), and wire accordingly. Here, the 5V is taken from an endstop input's positive terminal, taken to the 5V inputs on the external driver. The step/direction/enable pins on the Smoothieboard are taken to the GND inputs on the external driver. [http://www.reprapdiscount.com Reprap Discount] has a nice external driver called the Silencio. It does 1/128 microstepping, so using it with Smoothie makes a lot of sense since Smoothie can do higher step rates. It comes with an adapter for pololu-type drivers for RAMPS-type boards. However, you can also simply wire it to Smoothie's external driver connectors. No big deal though, you simply need to swap the step and enable pins in the configuration file. The step pin does not need to be inverted. The big mosfets on the Smoothieboard can handle up to 12Amps. Sometimes that's not enough. Say you want to control a big spindle, a gigantic heated bed, or a tesla coil. Typical Solid State Relays ( SSR ) can handle up to 40Amps easily, sometimes more. AC ones can run 220V AC, and DC ones up to 60V DC ( typically, look at the specs for yours ). To control your Solid State Relay ( SSR ), you will need one GPIO pin ( use one of the free ones on the board ideally ), and a connection to GND ( plenty of those ). A SSR is essentially a big switch : you cut a wire, plug each end of the cut wire into it's two terminals, and then you'll be able to control whether or not those two ends of the wire connect or not. Simple as that. In the case of TemperatureControl, where you use the SSR to control a heating element for example, there is a catch. SSRs have a low maximum frequency they can be switched at. You need to specify that frequency or Smoothie will drive it way too fast. In this example, the maximum frequency is 20Hz. On some boards, you might want to swap two axes. For example, you have a board that has two connectors on the Z axis, but you want to connect two motors to the Y axis ( which has only one connector ). In that case, all you need to do is exchange the 3 pin definitions for these two axes. Now your beta driver becomes your Z axis, and your gamma driver becomes your Y axis. Please note that the current control parameters do not get swapped : Alpha_current always controls the current for M1, no matter what you do to the step/direction pins. A Fuse is a device which sacrifices itself ( gets destroyed and stops letting electricity through ) if the current passing through it is higher than a certain value. As such, adding a fuse between your power supply and a power input on your Smoothieboard protects you against short circuits, overloading, mismatched loads, or any kind of device failure. You need to choose a fuse with a value higher than your “normal” current for a given circuit. For example if your heated bed consumes 10A, you want to have a 15A fuse protecting it, that way if everything is fine the fuse does not burn, but in case of a short circuit, it does. You can setup Smoothie to handle upto 3 extruders. (6 defined axis is the maximum the memory can handle). Simply add Extruder ( controlling the extruder motor ) and TemperatureControl ( controlling the hotend ) modules to the configuration file for each new extruder. One temperature input for the hotend. Smoothieboard has 4 thermistor inputs, this means one heated bed and three hotends, or four hotends and no bed. To add additional hotends you have the option of using thermocouple external boards, which can be connected to the SPI port : either a single one, or four using a SPI hub, leaving you with a maximam total of 8 hotends, or more if you chain SPI hubs. One MOSFET output : Smoothieboard has 6 MOSFET outputs maximum ( 3 small 3 big ) that can be used for hotends, but depending on whether or not you use a bed you might only have 5 available. However you can wire external MOSFETs or SSRs to any free GPIO pin, giving you as many as there are free GPIO pins ( going to 8 or more being then easy ). One stepper motor driver. Smoothieboard has 5 maximum ( depending on board type ). You need 3 for 3-dimensional movement, regardless of your arm solution. This leaves you being able to drive at most two extruders with the on-board drivers. However, wiring additional drivers is as simple as using free GPIO pins. Simply wire any pin on the Smoothieboard as the step, direction and enable pins for your external stepper driver. We will here concentrate on a dual extruder setup. The default configuration in the Smoothie firmware is for a single extruder. In order to setup a second one, you need to use the syntax dedicated to multiple extruder systems. This means using the “module generation” syntax you could be familiar with from the TemperatureControl and Switch modules. As you can see it is quite similar to the normal extruder configuration, only extended to multiple extruders. You can add other extruders the same way. There is no specific name you have to name your extruders, simply add as many as you want, with whatever names you want, as long as the names are different. Simply replace your current extruder configuration with this in the config file. You will also need to configure an additional TemperatureControl module for the hotend. It is recommended you read the TemperatureControl documentation. temperature_control.hotend2.enable            true           # Whether to activate this ( "hotend2" ) module at all. Please do not mindlessly copy/paste the examples here, they probably do not fit your particular setup. Understand what is going on, and actually adapt the configuration to your specific situation. These are only examples. If you have two extruders going into one hotend, you need to set-up two extruder modules, and one temperaturecontrol module. Make sure you name the temperaturecontrol differently from the extruder modules so none of them gets preference. The first extruder in this configuration is wired to M4, the second one to M5. If you have more extruders, you will need to use external stepper motor drivers. Please see the specific documentation for this in the 3D printer guide. temperatureswitch.psu.threshold_temp       45               #  Turn the PSU OFF above this temperature, and ON below this temperature. In Â°C. If you run into trouble, something doesn't work as it should, head over to the Troubleshooting page for a list of common problems and means of diagnosis. You can also contact the Community for help if you can't find an answer in the documentation. All software below either knows how to interface with (or how to generate g-code) for Smoothieware. Cura - 3D printing slicer and host. Prusa Control - A beginner-friendly interface for the Slic3r engine. 3Delta Printer Control - 3D printing host especially suited for delta printers. Smoopi - Host specifically written for Smoothieware, runs on rpi with touch screen or a desktop. bCNC - On the wiki: bCNC Open-Source CNC host with great preview and other operations. Set machine type to smoothie, and add Grbl_mode true to your smoothie config (Note: You must update to the latest version of Smoothieware to ensure compatibility with bCNC, and set the config option new_status_format true). CNC.js - Open-Source CNC host with lots of features, running in your browser. OpenSCAD.org - Open-Source CAD software. GCode plug-in for InkScape - CAM, Output GCode from SVG files in Inkscape. PyCAM - Open-Source CAM software. jscut - Open-Source in-browser CAM software. Fusion360 - Closed-source CAM with very advanced features, free for hobby/fablab/small business. Kiri:Moto by Grid.Space - Free web based toolpath generator with support for FDM, Laser Cutting and CNC Milling. V-carve is compatible if using this post-processor. GCode plug-in for InkScape - Laser/CNC CAM : Output GCode from SVG files in Inkscape. Video tutorial. Visicut - Full laser control application ( Host and CAM ), has Smoothieware interface. Video tutorial. LaserWeb - Web-based full laser control application ( Host and CAM ), use to generate GCode but not recommended to use as a streamer of rasters as they do not support streaming to smoothie properly and refuse to cooperate. Fast streamer - use for streaming raster images from a host to smoothie. Avoids the pauses when using LW to stream. Can handle upwards of 1,000 pixels/sec. Lightburn - LightBurn is layout, editing, and control software for your laser cutter..
«Host» software is software that is used to “talk” to your Smoothieboard. It allows you to control the machine ( for example “jog” the axes ), to “stream” a G-code job, or to upload it to the SD card, things like that. «Slicing» software is software that is used to take a 3D model file, and based on some settings you input, “slice” it into layers, and generate a G-code file that the Smoothieboard can then execute to print a thing. «CAM» software, or «CAM Package», for Computer Assisted Manufacturing, is software that is used to take a 3D or 3D file, and based on some settings you input, transform it into a list of tool movements ( G-code file ) for a machine that uses a tool to remove material from a workpiece.